We love getting to know your fur-kids! And we can't help but think you'll want to meet them, too! So without further ado, meet the sweet dogs we've photographed! Charlie the brown dog is a 10 year old bea-dox-box with a little cocker-schnauzer (as his parents like to say). He enjoys long naps on squishy things (all pillows, blankets, and soft objects belong to him) and has a newfound love of red bell peppers. 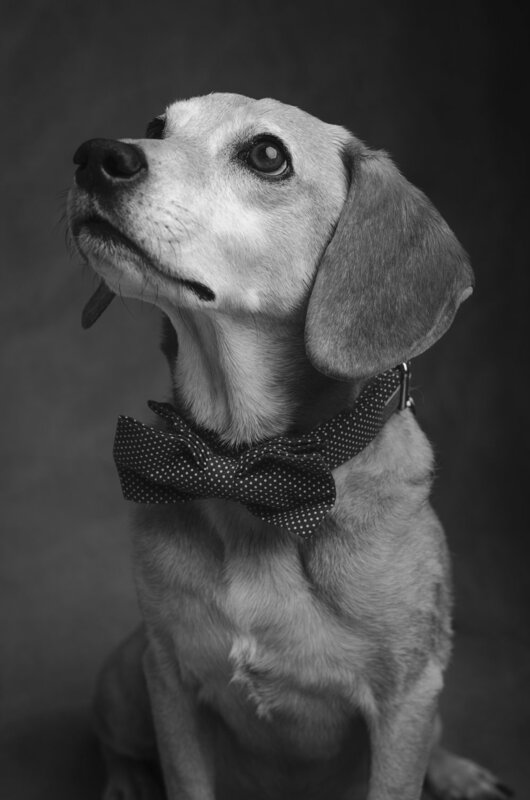 Charlie is also the proud owner of an extensive bow-tie collection and never goes to Starbucks for puppuccinos without one. Though a Houdini in his younger years, Charlie has traded his days of raiding the refrigerator and sneaking out of his yard (to take himself to the park), for napping in his pouf by the fireplace or sunbathing on the deck. Ike is a imported German Shepherd from Germany. Even though Ike doesn’t speak English he is quick to pick up on cues. While he has officially retired from police work, Ike’s passion is keeping others safe. He has been known to save his family's mini-farm from some pretty vicious predators. Ike enjoys long hikes in the woods, playing in the water with his human siblings, and an occasional double cheeseburger from McDonald’s. Don’t let his white hairs fool you, this K-9 companion can still search a house quicker than most humans. Ike is the definition of loyal and brave. Huck is a 13 year old who hasn't gotten the memo that he's considered a senior citizen. He's a Chow, Collie, Border Collie, Golden Retriever, Labrador, Rottweiler mix with super soft fur and super expressive ears. Huck spends his days chasing squirrels, sunbathing, and keeping an eye on things from his favorite window. Topanga the fawn pug is 8 years young, and found her forever home via a “free to good home” ad on Craigslist 7.5 years ago. She enjoys sunning herself on the deck, barking at potential intruders, pancakes, and being the big spoon while cuddling. She has been told she snores, but denies it. Topanga lives on the lake in Decatur, Illinois with 5 humans and a three-legged cat. Meet Gretel, a Yorkie/Jack Russel with a side of mystery breed. While her astounding beauty can bring a tear to your eye, don’t be fooled, this little lady has more personality than an everything bagel. In her former life, she was found heartworm positive in an overcrowded shelter in Tennessee. On the day she was scheduled to be with euthanized, she was saved by volunteers from a local rescue. She was brought to Decatur and received three rounds of heartworm treatments. During her third and final treatment, she found her forever home and is now living her best life. Today, she is fully recovered and enjoys long walks at the park, visiting her grandma and grandpa, and having the wind in her hair like she just doesn’t care. Flintstone is a 14-year old Golden Retriever/Irish Setter mix with the wisdom of a great-grandfather and the playfulness of a young pup. He loves playing with his toys, licking random objects, and taking long naps with his tongue out. Flintstone was adopted from a high-kill shelter with only a few days left before his time would come to an end. You’d never know that he had a rough first few years. He is all love, all the time! Kix is a 12 year old Golden Retriever with loads of joy and personality. He loves to be the center of attention. Kix enjoys taking long walks where he often stops to greet the neighbors, smell the flowers, and he takes every opportunity to bask in the sunshine while rolling on his back. He’s also quite the snuggler, all 90 pounds of him! Pumpernickel (“Picky”) is as Akita/Lab/Australian Cattle rescue. Like her name, she is slightly heavy and sweet. She adores people and her kitty brother, Binx. She spends most days lounging on an ottoman with Binx, chirping at birds and fending off any dog who dare approach her yard with her guttural howl. Picky lives a simple life. She’s a frequent visitor of the local dog spas, and likes to kick back with a stuffed grunting hedgehog at the end of a long day. Ming is a purebred Shar Pei. She’s brown eyed 12 year old beauty whose smile cannot be ignored. Ming has never met a stranger or a bad cookie. Ming is a proud mom and never says no to running errands with friends. She’s an avid Blackhawks fan, and in her old age, has taken to taking serious snooze breaks throughout the day. Olive is an almost five years-old mixed breed with so much joy for life! Some of her favorite things include popcorn and ice cream, and her stuffed toys. She loves everyone she meets, and should be a career snuggler - she gives the best hugs and kisses to everyone!